Sketches of Canada for December 6th! It has been called the worst manmade explosion in history. 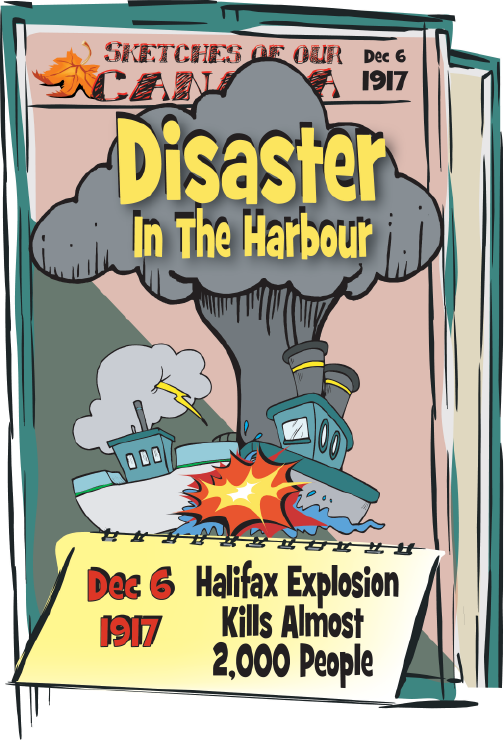 This Canadian History for Kids, Sketches of our Canada, looks at the devastation created by the Halifax explosion of December 6, 1917. On December 6, 1917, as World War I continued in Europe, ships carrying troops, supplies and munitions filled the harbour of the port city of Halifax, Nova Scotia. One ship, the Norweigian “Imo” was leaving the harbour heading to New York City, at the same time the French freighter Mont Blanc was entering into the harbour. The Mont Blanc was carrying extremely explosive munitions, including TNT and benzol. At approximately 9:00 a.m. that morning, the two ships collided in the Halifax harbour, setting the explosive munitions in the Mont Blanc on fire. The collision caused the Mont Blanc to head towards shore. Crowds along the waterfront gathered to watch the fire. The captain and crew of the Mont Blanc headed to shore in lifeboats and tried to warn people away. The Mont Blanc continued towards shore where it rammed Pier 6 setting it on fire. Fires spread quickly. The Halifax Fire Department quickly responded and were positioning themselves to the closest fire hydrant when the Mont Blanc exploded. The explosion killed more than 2000 people, injured another 9000, destroyed approximately 1600 building and 12,000 homes. Windows were shattered 50 miles away while the explosion could be heard for hundreds of miles. The explosion and fires were not the only damage. A tsunami wave was created and the next day a snowstorm began which lasted for nearly a week. The troops in the area rushed to help. Help also came from the Maritimes, central Canada and United States. Emergency teams were sent from Massachusetts and stayed for months. The people from Nova Scotia were so touched by the kindness of Boston that it sends a giant Christmas tree to Boston every year to thank them. Vincent Coleman, Railway Dispatcher, saved the lives of 300 people travelling on the train from Saint John, New Brunswick, when he telegraphed his warning “Hold up the train. Ammunition ship afire in harbour at Pier 6 and will explode. Good-bye boys”. He was killed in the explosion and is remembered as a hero.